HERE are the finalists of the THIS IS DESIGN competition. The winners will be announced once they have been notified. So, this time it was Samantha Apollis from Graphic Design who did it! 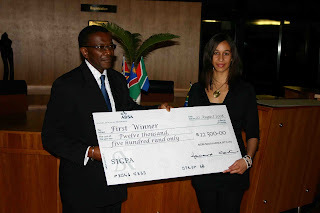 She WON the South African Bank Note Company's Banknote Design Competition. This is only the second year that we entered the competition. Here are pictures of the winning design, the winner getting her prize, and the team who made it happen. This is only the 2nd time we CPUT Graphic design, participated in this competition to redesign a full set on south african bank note. All main institutions offering graphic design as a course, all provinces in south africa, partakes in this competition. This year there were 300 entrants of which we were in the final 10 namely, Shameeg Baza, Ziyaad Hendricks and the winner being Samantha Apollis. 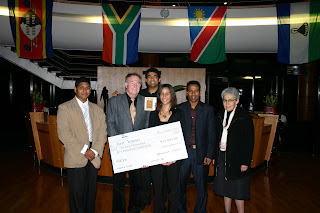 In 2007, we entered for the first time even though this competition has been running for a couple of years. Last year we reached the final but have not even reached 3rd place. It was won by VEGA design and advertising. NB. 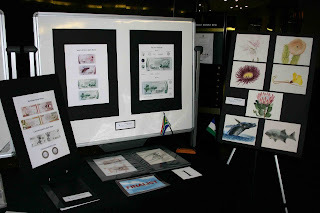 While the South African Reserve Bank is keenly interested and very supportive of the currency design competition, this competition is a South African Bank Note Society initiative and the fictional currency brief is deliberatively formulated to achieve certain graphic design objectives minimising restrictive influences. The competition brief is therefore completely independent, totally unrelated and not reflective of any current economic forces. While the SABNS requests written permission to publish the students final currency design in the copyright protected bimonthly society SABNS Review the designs and intellectual property resides with the student graphic designer.